Whatever one's quibbles, the Metropolitan Museum of Art is New York City's greatest asset - a cultural treasure-house of unparalleled splendor. Any institution so vast, of course, generates lots of quibbles. It tries to be too much to too many. Its growth in recent decades has been phenomenal in terms of size and impressive in terms of quality accessions. The physical expansion of the master plan, initiated in the museum's centennial year in 1970, for new construction of Kevin Roche John Dinkeloo Associates has been completed and further encroachments into Central Park are unlikely. In 1995, Philippe de Montebello, its suave director, unveiled its long-term plans for reorganizing and rearranging its interiors, a project that will take the better part of a decade to complete. The interior restructuring, while much less spectacular than the minimalist glass additions of the Lehman, Temple of Dendur and Michael C. Rockefeller African, Oceania and Americas Art wings, will radically revamp the southeast section of the museum to create major new spaces for the museum's Greek and Roman collections and will result in the removal of its large public restaurant facility to another location. In mid-April, 1999, the second phase of the new Greek galleries opened with three large skylights in the great vaulted corridor in the South Wing. This reinstallation led to the cleaning and restoration of many works, which was important, but the galleries themselves are not as elegant as they were before, cluttered with uninspired vitrines and with too many less than masterful works. The corridor skylights offer dramatic, shifting light on many days which is effective for viewing many of the sculptures, but the grandeur of the space has been somewhat compromised. When it launched its lavish and extensive reinstallation of its Egyptian galleries sometime ago, the museum wisely decided to exhibit much more of its collections and added "study" rooms for many works that were of lesser quality and condition, a boon to students. Given the magnitude, and splendor, of its collections, on the other hand, the wholesale display of too many works can not only be overwhelming but distract from an intense concentration on masterworks, many of which are hard to discover. Obviously, the "discovery" of the masterpieces is one of the joys of going to museum, but the haphazard placement of many of them can be taunting and frustrating for many hapless, time-pressured visitors. Acoustiguides, of course, are intended to help guide visitors to them, but are usually reserved for the special, temporary exhibitions. The Greek installation, unfortunately, does not have the adjoining "study rooms" found in the Egyptian galleries. In the early years of the century, the Great Hall was filled with copies of many famous statues. One goes to museums to see originals so their removal was correct, but such great spaces, and the Met has quite a few, cry out for sculptures as is well done in the Medieval Hall and the great Tribal and Pre-Columbian spaces. Under de Montebello's reign, nicely profiled by Calvin Tompkins in The New Yorker magazine in November, 1997, the Met has become a less controversial, but still imperfect place. Gone are former director Thomas P. F. Hoving's bluster, blunders and braggadocio, although his legacy of crass popularization and success-measuring by ticket-numbers remains, and a plan to get rid of the great staircase, shown at the left, was abandoned. With the greasy food peddlers, gum-stained, people-blocked steps, and omnipresent sales desks, a visitor might well think he was attending a gladiator's rout at some coliseum. But the Friday and Saturday night musicales are delightful, the Carroll and Milton Petrie European Sculpture Court, shown below, is divine, and the recent Annenberg gift of Impressionist and Post-Impressionist paintings dazzling. Despite the ubiquitous recorded tours and the frustrating and outrageous schedule of closing numerous galleries on different days because of inadequate funding for security, the Met is an overwhelming experience. How many days should a tourist devote to the Met at a minimum? The Met's collections are certainly world-class in many categories. Its Impressionist and Post-Impressionist paintings, its African, Pre-Columbian and Egyptian Art collections and its 19th Century American Paintings collections are stunning. Its Medieval Art, especially if one includes a visit to the wonderful Cloisters, and European Decorative Arts collections, are also wonderful and the André Mertens Galleries for Musical Instruments is very rich. In May, 1997, the museum reopened its Chinese Paintings galleries with great fanfare on the second floor of the north wing adjacent to the Florence and Henry Irving Galleries of Southeast Asian Art. Both installations are lavish, very impressive and very significant in broadening the museum's multiculturalism. The renovated Chinese Paintings galleries are stunning even if they are controversial. See The City Review's articles on the 1997 Tang gift of paintings from the C. C. Wang collection and the controversy over the original acquisition of 25 paintings from C. C. Wang in 1973, two-thirds of which are now on view again, a lengthy article that was not published on them by The New York Times and an update on them prior to the 1997 Tang gift. Controversies over attributions are no slight matter if we care about education and history more than reputations and monies. A respect for cultures other than our own is also very important and regardless of the attribution controversies there can be little doubt that the new attention paid handsomely at the Metropolitan to Asian and Southeast Asian art will open many wondrous eyes. Coupled with the Michael Rockefeller Wing of tribal and pre-Columbian art and the Japanese and Islamic art galleries, the Metropolitan has taken giant steps to revising our perception of the world. It has many great European paintings, such as El Greco's View of Toledo, Van Eyck's Judgment Day, a great Carpaccio, a great Georges de la Tour, several superb Vermeers and Rembrandts, a great Sassetta, the incredible "Expulsion from Paradise" by Giovanni di Paolo, a wonderful "St. George" by Carlo Crivelli, some fine small Flemish portraits, Rubens's Fox Hunt and an excellent Veronese, to mention the most obvious. If one were not familiar with the National Gallery in Washington and the great museums of Europe, one would be quite impressed with breath and depth of its European paintings, but for the connoisseur there are major gaps. Turner is underrepresented as are the German Expressionists like Nolde and Kirchner, Botticelli, Bosch, Caspar David Friedrich, Raphael, Canaletto, Fragonard and Schiele. Its 20th Century European paintings are also generally weak in masterpieces and with Cubism and Surrealism poorly represented as is 20th Century American paintings. Great Renaissance altarpieces are in absentia as are major works by many important artists. Such lacunae, of course, are hard to fill and rarely on the market. Yet other museums, notably the Getty, of course, the Cleveland Museum and the Kimball Museum in Fort Worth, have consistently shown up the Met in the quality of acquisitions for decades. The Met benefited by several major bequests of European paintings from Benjamin Altman, the founder of the famous department store, Jules Bache and Robert Lehman, founders of famous investment companies, and the Havemeyer family whose fortune came from sugar. Hoving incredibly broke the conditions of the Altman and Bache bequests that had called for their contiguous display, a condition insisted upon and granted to Robert Lehman and apparently also granted to the Annenberg collection, which is only on view for six months a year during the lifetimes of the benefactors. One can easily understand the desire of a museum not to have restrictions on how its bequests should be displayed: why not have all Vermeers in the same room, all Rembrandts in contiguous galleries, etc. The Met, alas, is a jumble in this regard and many visitors probably miss seeing some of its grandest treasures as a result. There is no easy solution, of course. Frankly, the Altman and Bache collections should be restored to unified display given their historical importance to the museum's collections and their very high artistic quality. This would help give a better sense of the great age of "robber baron" collecting in the beginning of the 20th Century. It would also help for the museum to indicate, perhaps on its displayed labels adjacent to individual paintings, where other important examples by the same artist are displayed elsewhere in the museum. Given the enormous crowds that usually are found in the painting galleries on weekends and in the special exhibitions at most times, it might also be a good idea to hang the paintings slightly higher, perhaps two feet higher, which would serve the dual purpose of increasing their security and visibility over the slow-moving throngs plugged into the recorded tours. A few years ago, the museum opened up the Henry R. Luce Center for the Study of America Art in which all of the paintings and objects of art not on main display were available for public viewing. The idea was noble, the implementation was not. Many paintings were hard to view under the glarish lighting in the narrow corridors of the study center. More important than this frustration was the fact that a good number of the department's best paintings were surprisingly relegated to this "back alley," raising curious questions about the department's connoisseurship as many on main display were of inferior quality. The issue of connoisseurship is important and is perhaps the single most important ingredient missing in the Met's cornucopia. There are seemingly countless delights at the Met, but they often are forlornly abandoned to inconsequential settings or off-the-beaten-path locations or juxtaposed with inferior quality items. While it is impractical to suggest that each masterpiece has its own room, like Mona Lisa at the Louvre or Las Meninas at the Prado, more attention should be paid to sorting. One gets the notion, sometimes, that the museum suffers from "the art directors' disease" that has afflicted most newspapers and periodicals and ignores content for the sake of stylish presentation with the result that no clues are offered to help differentiate importance. Such an equalitarian approach (in which art directors think all text is the same and only care about graphics) can make for challenging games for the fledging connoisseur, but it logically would lead to doing away with labels and a total reversion to elitism. The museum has taken its educational mission seriously in most instances and appropriately so. Indeed, museums, whose primary and most important function is to preserve and safeguard treasures, should be discovery places where imaginations are sparked. A shotgun approach to display encourages viewers to look carefully at everything so as not to miss something "important." Clearly, one can argue endlessly over "hanging" policies and problems of crowd control. Indeed, there are many New Yorkers who might wish to see the Met adopt the Frick Collection's policy of not allowing any children under the age of 6 admittance. Many have suggested in the past that the Met should be decentralized, that its African Art collection should be in Harlem, its Chinese Art collection in Chinatown, its American paintings at the Whitney, its modern paintings at the Guggenheim or the Modern, and so forth. Its encyclopedic scope is both thrilling and appalling. It is thrilling because one can quickly see how truly wondrous different cultures are, and multiculturalism is very important. It is appalling because the individual is overwhelmed by the mass and distinctions are blurred. Not all cultures achieve the same level of craftsmanship, refinement and sophistication. Not all aspects of individual cultures are equally well crafted, refined and sophisticated. Like many museums, the Met has never had enough space to display all its treasures. 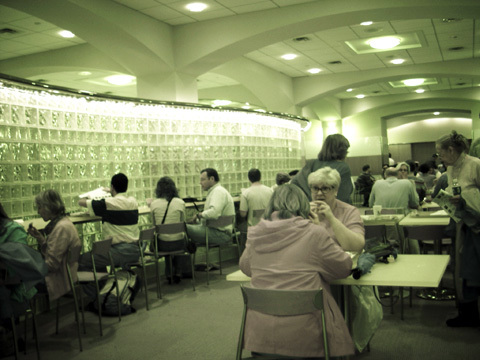 In the spring of 1999, the museum began the redesign of its south wing for its Greek and Roman art collections, part of which is shown above, that will eventually require the removal of the existing restaurant, shown in the photograph below. In May, 1999, The New York Times reported that the museum's plan to move the restaurant into new quarters around the Lehman Wing was being abandoned in favor of moving it to the Central Park side of the large sculpture court in the American Wing. The cafeteria will relocate to a facility on the ground floor. 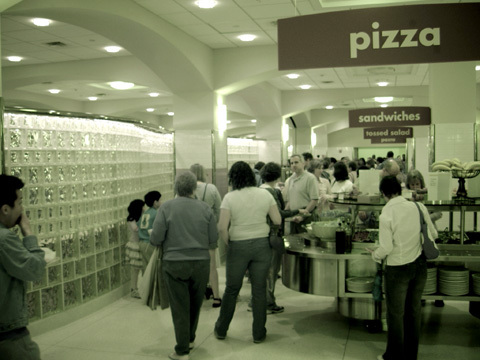 In June, 2003, the museum closed its cafeteria at its south end and opened up a new eating facility on its lower level with an entrance at the front of the Lehman Wing at the rear center of the museum. The new cafeteria has a greatly expanded and slightly more expensive menu. There are two elevators and two staircases that permit access to it. The good news is that its location is likely to make more visitors aware of the Lehman Wing. The bad news is that it has rather low ceilings and is not as grand as the former cafeteria. At 126, the venerable Met has succumbed from its limestone and red-brick masonry origins to glossiness. Only its Fifth Avenue facade has not been glassed in or cloaked in blank egg-cream walls. The main entrance of the Fifth Avenue facade is invariably marred by the huge pennants announcing current exhibitions. These pennants once were made with some design consciousness, but rarely now although the banner announcing the reinstallation of the Chinese Paintings galleries in 1997 after being closed for three years is not bad. They obscure the fairly handsome entrance with no artistic flair and should be relegated to blank walls on the north and south sides of the Fifth Avenue frontage and they should be designed with some artistry. The front steps are probably the most popular in the city, but are not particularly handsome and the arrogance of its sitters is contemptible for many senior citizens who often cannot even reach the scrawny brass banisters for support. The two fountains that flank the stairs are pathetic in their lack of design and were not part of Richard Morris Hunt's original design as shown on the cover of the museum's catalogue of its exhibition in 1996 on its architecture, shown above a bit enhanced digitally and also showing finished sculptures that do not exist still atop the columns. Hunt, of course, envisioned that the tops of the double columns would sport huge sculpture groups heralding the arts, but the uncarved stones one of which is shown below, remain to this day, marring an otherwise handsome facade. Hopefully, some rich kid will donate enough money to replace them with marble fountains and perhaps George Rickey sculptures or Isamu Noguchi sculptures, or whatever. Perhaps the same rich kid will also fund some artistic way to cover the large stretches of blank wall that remain near the rear of the museum facing the park and perhaps, even more importantly, fund enough security for the museum to open its Central Park entrance, which could save millions of visitors a lot of walking. Of course, patrons as wonderful as Lila Acheson Wallace, who provided the flowers in the grand lobby, are rare. It is inexcusable that any galleries are closed for lack of security. On many occasions, the Met has closed off major sections for long periods, ruining many a visitor's trip to New York. It's too late to decentralize the Met and it is politically impossible for it to encroach further into Central Park to accommodate its needs. Some future benefactors may well decide that their collections would be better off in smaller institutions, especially since the Met's proliferation of named galleries and wings and the like has become a farce with Johnny-Come-Latelies garnering more incised space than the titans who really made significant contributions. Hopefully, nevertheless, the museum will get more masterpieces to fill in its lacunae and perhaps it will see fit to grow upwards. Why not carry forward Kevin Roche John Dinkeloo and Associates' upward slants into some pyramidal form in the center of the museum, well behind the Fifth Avenue frontage, designed by McKim, Mead & White and completed in 1926, and the small pyramid of the Lehman Wing, which is visible at the left in detail shown above from the cover illustration of the museum's Summer 1994 Bulletin. Hopefully, such a pyramid could be sculpted so that Roche need not be accused of impinging on I. M. Pei's motifs while significantly adding what will be sorely needed space. There are very stalwart critics of modern architecture who deplore the end of the Beaux Arts and City Beautiful movements who were certainly offended by Roche's glass drapery at the Met. The new glass facades at the Met are slick, but uninspired. Skylights in museums are a mixed bag. Natural lighting can be very attractive especially as it changes, lessening a sensation of entrapment and entombment, but it can also create difficult problems with proper lighting of objects and when unfiltered and direct can be very damaging to artworks. The Charles Engelhard sculpture court in the American Wing, which has the handsome facade of the former U.S. Assay Office on its north side, is delightful because of its size, and planting, and natural light, although it is an abomination in its industrial and factory finishing. There is a substantial large area that could be covered by additional floors in the center that would also tie the disjointed configurations together and provide a new landmark in the park. Anyone who has visited the museum's Iris and B. Gerald Cantor rooftop sculpture garden knows that its vistas, shown above, are incomparable and can easily envision exciting uses for new enclosed, terraced public spaces, such as a restaurant, that might then free up more space for exhibition and administrative uses. Such a plan might only add a few stories in height, which because it would be angled and reflective, its intrusion into the visual space of the park would be considerably minimized. The treeline has already been broached, so why not strive for a fully integrated, important, practical and inspiring plan. The master plan has doubled the size of the museum in 25 years by the addition of approximately 1 million square feet of space. (The MetLife Building, formerly the Pan Am Building, straddling Park Avenue at 45th Street, has approximately 2.2 million square feet.) As de Montebello said in his article on "The Met and the New Millennium" in the same issue of the bulletin, "...the Met can never be too big, for once we acknowledge that it can be visited best only in sections, in small tastings, then, as with a long menu or a box of assorted chocolates, the more we have to choose from, the better."